Adult holiday parties are in full swing this time of year in Canada. Party planners can avoid the dreaded boredom with fun holiday-theme party games, without spending hours on preparation or explaining difficult rules. These adult holiday party games are fun, without making guests feel awkward or stupid (mostly anyway). Even the most reserved party guest will be swept up in the hilarity and have a fantastic time. A popular holiday game that can actually be the main event of your Christmas party. Have everyone bring a wrapped gift. You can put a price cap on it or accept gently-used items. It’s the perfect opportunity for your guests to regift too! Pile the gifts on a table so everyone can check them out. Use a stocking or decorated box to hold numbers (one number for each guest). Have everyone draw a number to determine the order of play. The first guest selects whatever gift appeals to them. They then open and announce their gift. The next player has the choice of stealing a gift from a guest that chose before them, or unwrap a new gift from the table. Play continues until everyone has a chance to keep or steal a gift. The first player ends the game by deciding if they want to keep the gift they have or steal another. Give everyone a pen & piece of paper. Have each guest write down two true holiday stories and one that’s untrue (three sentences or less). Guests take turns sharing their two truths and a lie. The other guests must guess which of the three is a lie. Give guests a point for each correct guess to see who is the best lie detector. This one is way more fun than kareoke. The host stands with guests circled around her. Everyone starts to sing The 12 Days of Christmas. When you get to the part where you name the gift (such as five golden rings), point to a random guest. The guest must come up with a gift without missing a beat. All guests join in to sing the rest. You can have a theme to make it more challenging. A fun example is The 12 Days of Christmas by Canada’s own Bob & Doug McKenzie. A fantastic game for couples, but it’s also a lot of fun for friends. Set up a large table with wrapping paper, scissors, tape, boxes and ribbon. Each pair must put their one arm around each other so they only have one hand free. Each team-of-two works together to neatly wrap their package as fast as they can. The first pair to attractively wrap their gift, ribbon and all, is the winner. Alternately, you can vote on which wrapping job is best to determine the winner. Or both! Yup, just like beer pong but with hard egg nog! Divide guests into two teams and provide them with a cup of Christmas cheer. Teams take turns trying to land a table tennis ball (or marshmallows) into the other team’s cups. When a player sinks a ball in the opponents cup, they get to take the cup and drink it. 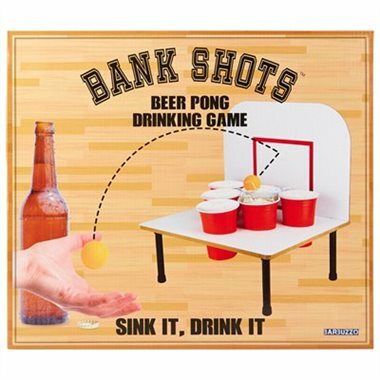 Pick up the Bank Shots Beer Pong Drinking Game to make it a seasonal sport! Use holiday words and phrases to make traditional charades more merry. If you don’t want to come up with ideas or make cards, check out the Christmas Charades Game. Write a bunch of holiday words and phrases on individual cards. The person who chooses the card acts it out without speaking. Each team takes turns trying to guess. Christmas Pictionary puts a holiday twist on a classic party game. Use Christmas carols, holiday movies, traditions and other festive themes to come up with phrases. Write them on index cards and set up a large whiteboard. Choose red & green erasable markers for an added holiday touch. Split guests into two teams. Teams take turns sending one player to the board. They take a card and attempt to draw clues on the whiteboard until someone guesses correctly. They can’t use numbers, letters, or hand gestures. Both teams try to guess the phrase. If one team member guesses the right answer first, that team gets a point. If the other team guesses the answer first, no point is awarded. Pick up some fun, inexpensive novelty prizes to round out the night. You can wrap them up and put them under the Christmas tree and let the winner of each game choose one. Please don’t let your guests drink (or do drugs) and drive! 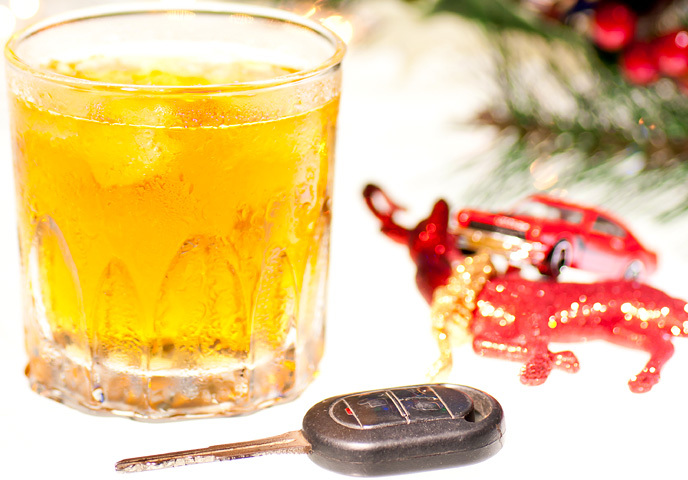 Make sure they have a designated driver, call them a taxi or use Operation Red Nose if it’s available in your area. 2 Responses to "Popular, Easy Christmas and Holiday Party Games for Adults"
I expect to do a ton of entertaining this year and these games will be just the thing to keep everyone having fun! I need more so I’ll keep hunting. Thanks for these versatile party game ideas. I was actually looking for party games for a bachelorlette party and found some of these can work for any theme! Should be fun!